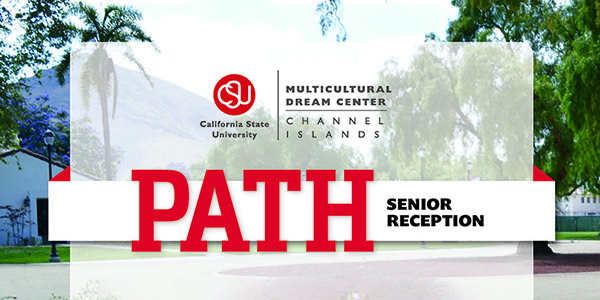 April 15, 2019 – Graduating seniors are invited to participate in the second annual senior reception for Promoting Achievement Through Hope (PATH) on Tuesday, May 14 at 5:30 p.m. in the Petit Salon. PATH supports foster youth, students who have experienced homelessness, were in guardianship or kinship care, or were adopted.The PATH Senior Reception is a way for students to celebrate their accomplishments in a more intimate setting with their supporters. Graduates are welcome to invite as many guests as they’d like. The cost to participate in the program is a $20 deposit and payment must bee made in cash to a professional staff member in the Multicultural Dream Center (Bell Tower 1530) no later than 5 p.m. on May 3. On the day of participation, the deposit will be returned to the student. Please RSVP here if you plan to attend. For more information contact Leticia Cazares at 805-437-3528 or leticia.cazares@csuci.edu.